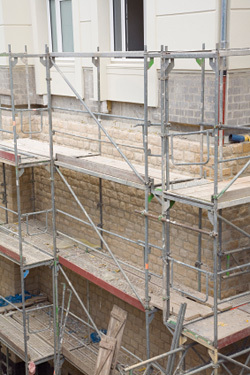 The scaffolding on a building site is usually one of the most important tools that will be used by professionals in this field, and since an individual's life could end up relying on the sturdy nature of these items, it is usually best to conduct a scaffolding inspection before the device is put to work. Conducting this type of inspection is not something that should be taken lightly; in fact, a few strict rules should be followed whenever this task is taken on. In order to be able to conduct a scaffolding inspection, individuals need to ensure that they have received the appropriate training and undergone an assessment by the appropriate governing body. In some instances, an individual who has undergone basic training will be able to inspect a basic scaffold structure. It is usually best for inspectors to be trained by specific manufacturers, since this will allow them the chance to build on their knowledge of a specific brand of scaffold. The more specialised their knowledge, the more competent they will be when they enter into the field to begin their inspections. It is usually advised that a scaffolding inspection be conducted before it is put to work, as well as every seven days after it has been constructed. Individuals who are going to be making use of this item should also remember that certain adverse conditions could end up making the item vulnerable to imperfections, and so every time the device is exposed to these specific conditions, it should be inspected again, regardless of the date of the last inspection. If any imperfections or weak points appear in the device, a professional should be called out immediately to make the appropriate repairs, or the item should be entirely replaced; after all, individuals will not want to take any chances when there are lives on the line. When setting up the guardrails, individuals should remember that they should extend at least 950mm past the work platform, and there should be no gaps that are larger than 470mm. This specific requirement has been put in place so that neither the workforce nor the materials are in danger of falling from the scaffold. Before a scaffold is built, individuals need to ensure that they come up with a design drawing that has been completed with the appropriate calculations in mind so that the stability and strength can be determined long before the item is erected. During the scaffolding inspection, it might be a good idea for professionals to start out by inspecting this facet of the construction job so that they can determine whether the item has been put together correctly on paper; this is also a quick and easy way to determine whether alterations need to be made. In order to determine the appropriate height during the scaffolding inspection, individuals need to ensure that they read through the instruction manual that is provided by the manufacturer, since these specifications tend to differ from one product to another.